"We're like two peas in a pod." If you adore dogs, there are probably not many things can melt your heart faster than the sight of a bonded canine duo. Dogs often bond intensely with the other pooches around them, especially if they've spent their entire lives together, littermates or not. Separating them isn't at all easy. A lot of different factors can lead to a pair of dogs living together for their entire lives. They might be littermates, for example. They might be a mother and offspring. Bonded pairs don't necessarily have to be family -- they can be a duo of dogs who, for one reason or another, lived closely alongside each other starting from their tender days as puppies. When two dogs have spent essentially every minute possible together since birth, they often develop extremely strong attachments -- or bonds -- to each other. They have lunch as a team, nap as a team, relax as a team and so forth. Splitting up a pair of bonded dogs often can be extremely stressful to the furry cuties. Since bonded pairs who have been together from the start aren't used to the concept of life all by themselves, they tend to feel helpless and lost without the comfort and stability of their companions. Bonded pairs thrive on the others' company for numerous different reasons, including adapting to unfamiliar scenarios, coping with frustration and even knowing how to react to other dogs and humans. If you are in the company of a doggie who has recently been separated from his "other half," you might notice conspicuous indications of mourning -- think appetite loss, whimpering, sleeping issues, no enthusiasm for "fun" activities, house soiling issues and low energy. Like humans, canines also need time to process their feelings and heal amidst major life changes. Since separating bonded dogs can be extremely stressful on the fluffballs, many shelters and animal rescue organizations only allow people to adopt them in pairs. Separating bonded dogs isn't easy, but sometimes has to be done for whatever reason. Life happens, after all. The goal should be to make the transition to the new "life" as easy and natural as can be. Offer your pet as much familiarity as possible. 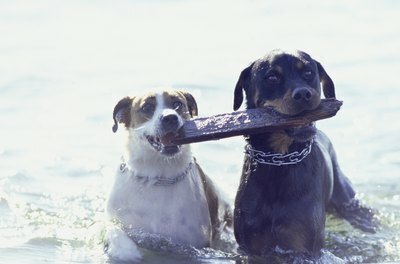 If you're taking one dog, and your former roommate is taking another, for example, try to provide some happy "reminders" of the comforting time your pooch spent with his best bud -- think old toys, blankets, crates and the like. Another way you can make the separation process easier is by keeping your dog's routine as similar as you can to how it was before. This goes for meals, treats, naps and so on. Your dog's world is already rocked by the sudden absence of his closest pal, so it's important to do whatever is necessary to keep things calm, reliable and stable. Your pooch might not have the option to hang out with his bonded buddy, but he still has you. It's extremely key for him to have your unwavering support during this stressful period of his canine life. If that means you need to amp up the snuggling time, outdoor walks and fetch sessions, then that's what you have to do. A few new and exciting interactive toys can't hurt, either. Almost Home Foundation: Bonded Pairs - What Are They? Why Are They Important? Florida Veterinary Behavior Service: Do Dogs and Cats Grieve? What Chemical Is Found in Chocolate That Is Poisonous to Dogs & Cats? How Are Dogs Invited to the Westminster Kennel Club Dog Show?